Welcome to the authors' own companion site for WebSphere Application Server Administration Using Jython, published by IBM Press. Here, you will find sample scripts and articles by the book authors. Some of the articles compliment material in the book. Other articles introduce material the authors feel might interest you. Click here to see an annotated table of contents from our book. The description of each chapter contains links to articles and sample code that enhance the information in the book. Click here to see a list of articles that the authors feel every WAS administrator should know about. These articles will go beyond the topics discussed in WebSphere Application Server Administration Using Jython. Barnes & Noble. You can search by zip code to find a Barnes & Noble store that has the book in stock and they will hold a copy for you. from Amazon ... a pick for any advanced library offering analysis of web services in general and Jython scripting in particular. From mastering Jython rules to using scripting to list, view, and install AppServer applications, this is a pick for any working in any WebSphere environment. 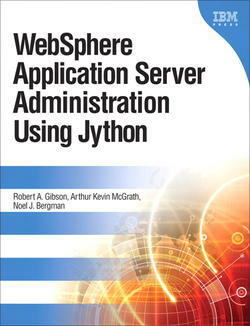 from WebSphere Community Blog After spending a considerable amount of time teaching myself Jython and learning to administer WebSphere Application Server using it, I wish I had a copy of this book when I first started writing Jython scripts for WebSphere Application Server administration. The authors do a great job of both introducing the reader to the Jython language as well as introducing the reader to the WebSphere Application Server administrative objects. from Amazon Canada This book gave me a good head start ... paired with the IBM documentation it almost covered everything I needed. from Amazon UK This book clearly explains these [administrative scripting] objects, how to use them and gives sample jython scripts that provide a useful toolkit. As an additional bonus the scripts are available from the download page of the Book's entry at IBM press.